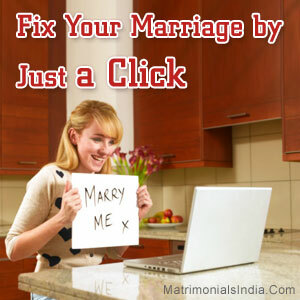 The heading "Fix Your Marriage by just a click" is a thumping statement on how internet has been able to penetrate into our lives and in molding the ways by which we make even the most crucial decisions. A decade ago, such a statement would have garnered no more than laughter bursts but today, this has real substance to it. With great respect to the institution of marriage and no compromise to its seriousness and sanctity, it is possible to fix marriages by just a few clicks. Let's take a look how. Matrimonial endeavors begin with scouting for the right grooms/ brides. Earlier, vectors of matrimonial information used to be relatives, close friends, priests, etc. but now scenario has undergone a drastic change. Thousands of Matrimonial Websites and Portals have emerged; these platforms are ideal for Matrimonial Searches. Matrimonial Websites are a complete package. They are informative; give you comprehensive information on listed prospective grooms and brides; you can browse by narrowing your search according to social status, religion, caste, sect, profession, etc. You can get a complete picture about a girl or a boy listed on such sites, provided you are allowed accessing the information. When you register on a Matrimonial Website, you get access to a host of online services and facilities. Premium packages even allow you to chat online with the one you are interested to know more about. You can share your likes, dislikes, exchange views and in the process get to know more about each other. All this is very simple and convenient for the stakeholders. You need not take leave from your office and find extra time; you can stay in touch with on the move, at your home, in office, anywhere. The pace that virtual world has imparted to Matrimonial Searches and selection process, is really commendable. All that one requires is to get registered on a reliable Matrimonial Website, create a profile, upload information and just get going. Truly, finding a partner and fixing a marriage was never as fast and simple as today.